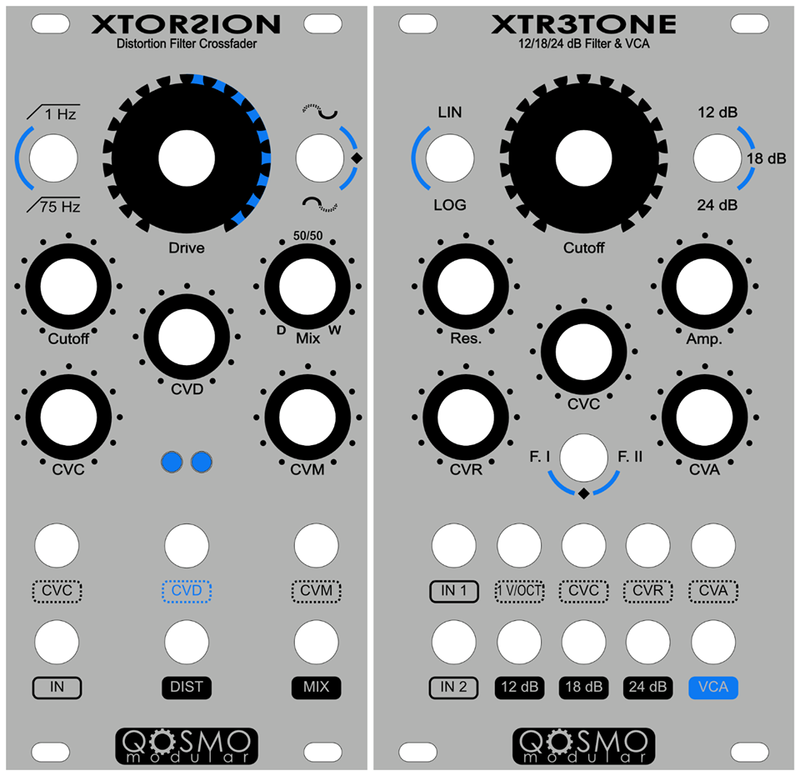 XTorsion: Overdrive and Distortion with VC drive, 12 dB Filter with VC cutoff and, Crossfader beetwen dry & wet signal with CV mix. Soft clipping through vintage germanium diodes and blue leds. Switch to cut upper or lower signal, or leave unaffected. One input for signal and two outputs: distorted and filtered signal out and dry/wet signal out. All CV INs have a dedicated attenuator. Skiff module with high quality components. Hand-made with extremely care. 12 HP. 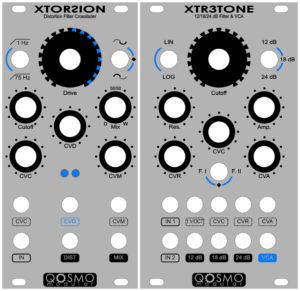 XTr3tone: Low pass filter and VCA. The module has two input signals. The three main outputs are: 12 dB, 18 dB and 24 dB. It’s not all, you can decide to route one of these filter outs to a VCA, the fourth output. Filter cutoff is VC and so is the Resonance. A third VC input is the control for VCA. You can switch this control beetwen lin and log. A very important feature is the ability to switch in No Resonance Mode, or Feedback I, or Feedback II for more screaming. All CV INs have a dedicated attenuator. Skiff module with high quality components. Hand-made with extremely care. 14 HP. More news about availability very soon. 2017 © - Qosmo Modular - All rights reserved.